We often assume that the software programs we get in the laboratory don't make mistakes. But sometimes the software programmers enable a "feature" that is actually what many would consider an "error." It might disguise real outliers (on the left) and make them look like minor acceptable variations (on the right). Just because it's software doesn't magically make it correct - laboratories still need to use their professional judgment to evaluate their QC and their software. 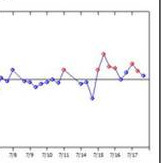 Is your QC software disguising outliers or detecting errors? Continuing in our analysis of the 2014 Lenters-Westra and Slingerland study on HbA1c quality for POC devices, Dr. Westgard digs into the data on the performance of 7 different point-of-care HbA1c devices - this time examining a second lot of reagent. Most studies only look at one lot of reagent, but Lenters-Westra and Slingerland examined two, giving a better picture of what laboratories would truly experience if they had these methods and devices in routine operation. 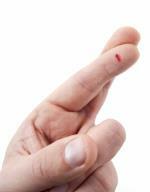 How many HbA1c devices do you think can hit the bull's-eye with both reagent lots? QCPs are coming soon for US laboratories. Learn if they're right for you at the POC, in the core lab, or with your LDTs. 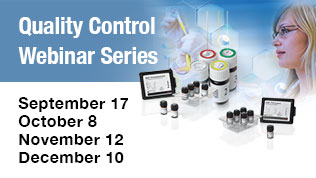 Learn whether you're ready for a Total Quality Control Plan or just an Individualized QCP. Learn how Risk Assessment can be performed not just by guesswork, but by good data. These webinars include not only a lecture but also a Q&A session. Capacity [bandwidth] for attendance is limited. Priority is given on a first-requested, first-enrolled basis. Registration is required. "Westgard Rules" is the eponymous multirule QC procedure that we've discussed for decades. Six Sigma is a newer concept, but we've been educating laboratories about it for nearly 15 years. The two concepts, of course, are related. The quality of your method determines the quality you must put into your control. 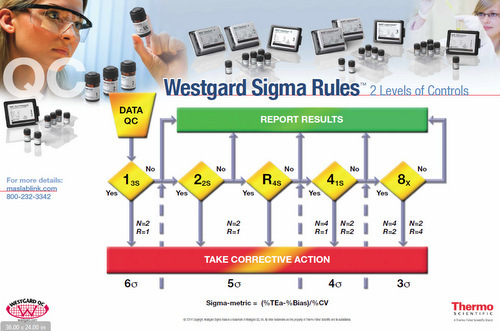 Putting the two together, we've formulated the Westgard Sigma RulesTM, a visual tool that allows you to determine your performance and your required QC effort in a single glance. The results of the Bobble-head raffle are in!